Adrants reports of ad agency Fletcher Martin hijacking billboards in the Atlanta area for their client Arby's. The concept is to float balloons with the Arby's logo above the heads of people appearing on billboards (like local TV weather gals), in support of their "I'm thinking Arby's" campaign. 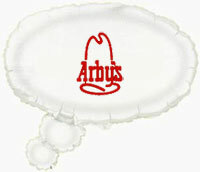 The "I'm thinking Arby's" thought ballon concept isn't new. When Arby's launched their new website in June 2006 visitors could create their own thought balloons with their favorite Arby's menu item. This is a subtle campaign, and something Fletcher Martin is probably only doing in their HQ of Atlanta... a little guerrilla marketing fun for their creative department. But we couldn't help thinking that maybe a custom 'thought balloon' like this one, although not as subtle, might have been even better. This BK Is "Out of Meet"